(Phys.org)—Using objects obtained for the express purpose of adornment is a trait found only in humans, though some have speculated that our early cousins, the Neanderthals, might have done so as well. Some prior research has shown that some groups of them might have used eagle claws as a type of jewelry, while others have suggested they might have tied feathers together and worn them as a headdress, such as native Americans did. But, until now, no clear evidence had been presented to give credence to such theories. In this new effort a group made up of researchers from several different countries looked at the available evidence regarding wing bones and determined that it appears likely that Neanderthals did, as they report in their paper in PLoS ONE, use long wing feathers as a means of adornment. Finding evidence that supports the notion that Neanderthals used feathers to adorn themselves is more than a simple matter of interest, doing so also offers evidence that indicates that the hominins possessed a higher degree of intelligence than has been assumed; and if that is the case, the question of why they died out as we prospered becomes even more difficult to answer. To find evidence of feather adornment, the researchers first looked at the massive amount of data that has been collected on both birds and Neanderthals, specifically regarding their geography and whether birds with long feathers even lived in the areas where Neanderthals roamed. In all, they studied data from 1,699 sites across Eurasia and found that there was indeed a correlation and that there appeared to be a lot of raptor and corvid species living in the same areas as Neanderthals. 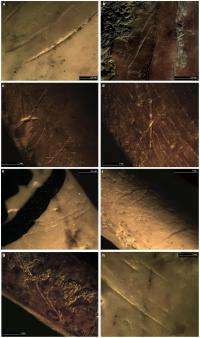 The team then turned their attention to actual bird bones found around or near Neanderthal archeological finds and discovered that many of them were wing bones that had been manipulated with sharp stones, causing cutting marks, a clear indication that they had been used for some purpose other than as food as wings don't have any meat on them. They noted also that the Neanderthals appeared to have a preference for birds with dark feathers. Also, they found that marked bones were found at many of the sites indicating that whatever was going on wasn't local. These findings indicate that Neanderthals were clearly using the long wing feathers for something, and the logical conclusion is that it was for adornment, as that was what humans tended to do with them. The team's findings don't prove that Neanderthals adorned themselves with feathers, of course, but it does offer strong evidence, and because of that, more research will likely focus on other advanced intellectual abilities of Neanderthals, and whether there was some other characteristic they possessed that might have led to their demise. The hypothesis that Neanderthals exploited birds for the use of their feathers or claws as personal ornaments in symbolic behaviour is revolutionary as it assigns unprecedented cognitive abilities to these hominins. This inference, however, is based on modest faunal samples and thus may not represent a regular or systematic behaviour. Here we address this issue by looking for evidence of such behaviour across a large temporal and geographical framework. Our analyses try to answer four main questions: 1) does a Neanderthal to raptor-corvid connection exist at a large scale, thus avoiding associations that might be regarded as local in space or time? ; 2) did Middle (associated with Neanderthals) and Upper Palaeolithic (associated with modern humans) sites contain a greater range of these species than Late Pleistocene paleontological sites? ; 3) is there a taphonomic association between Neanderthals and corvids-raptors at Middle Palaeolithic sites on Gibraltar, specifically Gorham's, Vanguard and Ibex Caves? and; 4) was the extraction of wing feathers a local phenomenon exclusive to the Neanderthals at these sites or was it a geographically wider phenomenon?. We compiled a database of 1699 Pleistocene Palearctic sites based on fossil bird sites. We also compiled a taphonomical database from the Middle Palaeolithic assemblages of Gibraltar. We establish a clear, previously unknown and widespread, association between Neanderthals, raptors and corvids. We show that the association involved the direct intervention of Neanderthals on the bones of these birds, which we interpret as evidence of extraction of large flight feathers. The large number of bones, the variety of species processed and the different temporal periods when the behaviour is observed, indicate that this was a systematic, geographically and temporally broad, activity that the Neanderthals undertook. Our results, providing clear evidence that Neanderthal cognitive capacities were comparable to those of Modern Humans, constitute a major advance in the study of human evolution. Today the same Neanderthals wear business suits. This is consistent with how they have been found to have skeleton wear consistent with pelt (et cetera) scraping, as well as hunting patterns for seasonal pelt industry. They were interested in wearables and apparently also how to adorn them.